A premier fence company located just north of Middlebury, we are proud to offer free estimates and installations throughout Vermont, New York and New Hampshire! MFC provides top notch customer service, quality products, an expert sales team, and professional installations for fence jobs big and small! 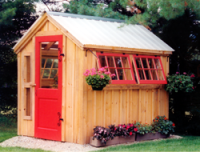 MFC is now proud to offer and install quality products locally made by Jamaca Cottage; including beautiful Chicken Coops, Storage Sheds, Green Houses, Bus Stops and More! Fences of all types-wood, metal, vinyl, etc.